You can now pre-load your PS4 games! PC gamers have been able to pre-load games for ages. Buy a game on Steam, well ahead of release, download the files, and you’re able to play the game as soon as the clock strikes midnight. It’s the sort of stuff that’s made midnight launches irrelevant. Now, that feature is available on your PlayStation 4..though it’s limited to just two handfuls of games right now. The first of those games to go live is Transformers: Rise of the Dark Spark if you feel like testing it out. 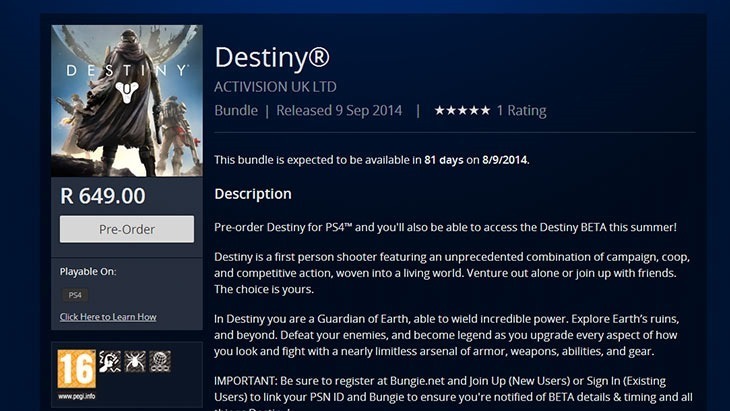 I’m quite seriously contemplating throwing down the cash for Destiny though, and getting it downloaded and ready for its September release. I do, however, find it a bit cheeky that you can already pre-order games like Uncharted 4 and LittleBigPlanet 3, especially digitally. The whole point of pre-ordering was to make sure that you got stock – but that’s a constraint that doesn’t exist when it comes to digital content. You planning on getting any of those games? I’m hesitant, mostly because digital games on the PS4 tend to cost quite a bit more than their retail counterparts here in South Africa. that’s not true for Destiny though, which is available digitally for about R150 less than a full retail price store-bought copy. Next article The trailer for VIDEO GAMES: THE MOVIE just spawned!